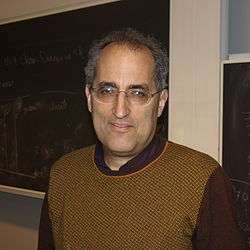 Edward Witten (/ˈwɪtən/; born August 26, 1951) is an American mathematical and theoretical physicist. He is the professor of mathematical physics at the Institute for Advanced Study in Princeton, New Jersey. In addition to his contributions to physics, Witten's work has significantly impacted pure mathematics. In 1990 he became the first and so far the only physicist to be awarded a Fields Medal by the International Mathematical Union. In 2004, Time magazine stated that Witten is widely thought to be the world's smartest living theoretical physicist. Witten was born in Baltimore, Maryland. He is the son of Lorraine (Wollach) Witten and Louis Witten, a theoretical physicist specializing in gravitation and general relativity. Witten attended the Park School of Baltimore (class of '68), and received his Bachelor of Arts with a major in history and minor in linguistics from Brandeis University in 1971. He published articles in The New Republic and The Nation. In 1968, Witten published an article in The Nation arguing that the New Left had no strategy. He worked briefly for George McGovern's presidential campaign. Witten attended the University of Wisconsin–Madison for one semester as an economics graduate student before dropping out. He returned to academia, enrolling in applied mathematics at Princeton University in 1973, then shifting departments and receiving a Ph.D. in physics in 1976 under David Gross, the 2004 Nobel laureate in Physics. He held a fellowship at Harvard University (1976–77), visited Oxford University (1977–78), was a junior fellow in the Harvard Society of Fellows (1977–80), and held a MacArthur Foundation fellowship (1982). Witten was awarded the Fields Medal by the International Mathematical Union in 1990, becoming the first physicist to win the prize. Although he is definitely a physicist (as his list of publications clearly shows) his command of mathematics is rivaled by few mathematicians, and his ability to interpret physical ideas in mathematical form is quite unique. Time and again he has surprised the mathematical community by a brilliant application of physical insight leading to new and deep mathematical theorems... [H]e has made a profound impact on contemporary mathematics. In his hands physics is once again providing a rich source of inspiration and insight in mathematics. 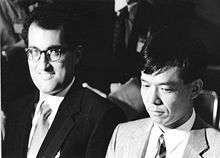 Edward Witten (left) with mathematician Shigefumi Mori, probably at the ICM in 1990 where they received the Fields Medal. As an example of Witten's work in pure mathematics, Atiyah cites his application of techniques from quantum field theory to the mathematical subject of low-dimensional topology. In the late 1980s, Witten coined the term topological quantum field theory for a certain type of physical theory in which the expectation values of observable quantities encode information about the topology of spacetime. In particular, Witten realized that a physical theory now called Chern–Simons theory could provide a framework for understanding the mathematical theory of knots and 3-manifolds. Although Witten's work was based on the mathematically ill-defined notion of a Feynman path integral and was therefore not mathematically rigorous, mathematicians were able to systematically develop Witten's ideas, leading to the theory of Reshetikhin–Turaev invariants. Another result for which Witten was awarded the Fields Medal was his proof in 1981 of the positive energy theorem in general relativity. This theorem asserts that (under appropriate assumptions) the total energy of a gravitating system is always positive and can be zero only if the geometry of spacetime is that of flat Minkowski space. It establishes Minkowski space as a stable ground state of the gravitational field. While the original proof of this result due to Richard Schoen and Shing-Tung Yau used variational methods, Witten's proof used ideas from supergravity theory to simplify the argument. A third area mentioned in Atiyah's address is Witten's work relating supersymmetry and Morse theory, a branch of mathematics that studies the topology of manifolds using the concept of a differentiable function. Witten's work gave a physical proof of a classical result, the Morse inequalities, by interpreting the theory in terms of supersymmetric quantum mechanics. By the mid 1990s, physicists working on string theory had developed five different consistent versions of the theory. These versions are known as type I, type IIA, type IIB, and the two flavors of heterotic string theory (SO(32) and E8×E8). The thinking was that out of these five candidate theories, only one was the actual correct theory of everything, and that theory was the one whose low energy limit matched the physics observed in our world today. Speaking at the string theory conference at University of Southern California in 1995, Witten made the surprising suggestion that these five string theories were in fact not distinct theories, but different limits of a single theory which he called M-theory. Witten's proposal was based on the observation that the five string theories can be mapped to one another by certain rules called dualities and are identified by these dualities. Witten's announcement led to a flurry of work now known as the second superstring revolution. Another of his contributions to physics was to the result of gauge/gravity duality. In 1997, Juan Maldacena formulated a result known as the AdS/CFT correspondence, which establishes a relationship between certain quantum field theories and theories of quantum gravity. Maldacena's discovery has dominated high energy theoretical physics for the past 15 years because of its applications to theoretical problems in quantum gravity and quantum field theory. Witten's foundational work following Maldacena's result has shed light on this relationship. In collaboration with Nathan Seiberg, Witten established several other results. In their paper on string theory and noncommutative geometry, Seiberg and Witten studied certain noncommutative quantum field theories that arise as limits of string theory. In another well known paper, they studied aspects of supersymmetric gauge theory. The latter paper, combined with Witten's earlier work on topological quantum field theory, led to developments in the topology of smooth 4-manifolds, in particular the notion of Seiberg–Witten invariants. Witten has been honored with numerous awards including a MacArthur Grant (1982), the Fields Medal (1990), the Nemmers Prize in Mathematics (2000), the National Medal of Science (2002), Pythagoras Award (2005), the Henri Poincaré Prize (2006), the Crafoord Prize (2008), the Lorentz Medal (2010) the Isaac Newton Medal (2010) and the Fundamental Physics Prize (2012). Since 1999, he has been a Foreign Member of the Royal Society (London), and in March 2016 was elected an Honorary Fellow of the Royal Society of Edinburgh. Pope Benedict XVI appointed Witten as a member of the Pontifical Academy of Sciences (2006). He also appeared in the list of TIME magazine's 100 most influential people of 2004. In 2012 he became a fellow of the American Mathematical Society. Witten has been married to Chiara Nappi, a professor of physics at Princeton University, since 1979. They have two daughters, Ilana , a neuroscientist at Princeton University) and Daniela, a biostatistician at University of Washington, and one son, Rafael, and a granddaughter Nava. Witten sits on the board of directors of Americans for Peace Now and is also on the advisory council of J Street. Green, M., John H. Schwarz, and E. Witten. Superstring Theory. Vol. 1, Introduction. Cambridge Monographs on Mathematical Physics. Cambridge, UK: Cambridge University Press, 1988. ISBN 9780521357524. Superstring Theory. Vol. 2, Loop Amplitutes, Anomalies and Phenomenology. Cambridge, UK: Cambridge University Press, 1988. ISBN 9780521357531. ↑ "Announcement of 2016 Winners". World Cultural Council. June 6, 2016. Retrieved June 6, 2016. 1 2 Atiyah, Michael (1990). "On the Work of Edward Witten" (PDF). Proceedings of the International Congress of Mathematicians. pp. 31–35. ↑ Lemonick, Michael (April 26, 2004). "Edward Witten". Time. Retrieved November 1, 2011. 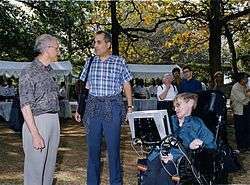 "At a 1990 conference on cosmology," wrote John Horgan in 2014, "I asked attendees, who included folks like Stephen Hawking, Michael Turner, James Peebles, Alan Guth and Andrei Linde, to nominate the smartest living physicist. Edward Witten got the most votes (with Steven Weinberg the runner-up). Some considered Witten to be in the same league as Einstein and Newton." See "Physics Titan Edward Witten Still Thinks String Theory 'on the Right Track'". scientificamerican.com. 22 September 2014. Retrieved 14 October 2014. ↑ The International Who's Who 1992-93, p. 1754. 1 2 3 Woit, Peter (2006). Not Even Wrong: The Failure of String Theory and the Search for Unity in Physical Law. New York: Basic Books. p. 105. ISBN 0-465-09275-6. ↑ Witten, Edward (1989). "Quantum Field Theory and the Jones Polynomial" (PDF). Communications in Mathematical Physics. 121 (3): 351–399. Bibcode:1989CMaPh.121..351W. doi:10.1007/BF01217730. ↑ Reshetikhin, Nicolai; Turaev, Vladimir (1991). "Invariants of 3-manifolds via link polynomials and quantum groups". Inventiones Mathematicae. 103 (1): 547–597. Bibcode:1991InMat.103..547R. doi:10.1007/BF01239527. ↑ Witten, Edward (1981). "A new proof of the positive energy theorem". Communications in Mathematical Physics. 80 (3): 381–402. Bibcode:1981CMaPh..80..381W. doi:10.1007/BF01208277. ↑ Schoen, Robert; Yau, Shing-Tung (1979). "On the proof of the positive mass conjecture in general relativity". Communications in Mathematical Physics. 65: 45. Bibcode:1979CMaPh..65...45S. doi:10.1007/BF01940959. ↑ Schoen, Robert; Yau, Shing-Tung (1981). "Proof of the positive mass theorem. II". Communications in Mathematical Physics. 79: 231. Bibcode:1981CMaPh..79..231S. doi:10.1007/BF01942062. ↑ Witten, Edward (1982). "Super-symmetry and Morse Theory". Journal of Differential Geometry. 17: 661–692. ↑ Witten, Edward (1995). "String theory dynamics in various dimensions". Nuclear Physics B. 443 (1): 85–126. arXiv:hep-th/9503124 . Bibcode:1995NuPhB.443...85W. doi:10.1016/0550-3213(95)00158-O. ↑ Juan M. Maldacena (1998). "The Large N limit of superconformal field theories and supergravity". Advances in Theoretical and Mathematical Physics. 2: 231–252. arXiv:hep-th/9711200 . Bibcode:1998AdTMP...2..231M. doi:10.1063/1.59653. ↑ Edward Witten (1998). "Anti-de Sitter space and holography". Advances in Theoretical and Mathematical Physics. 2: 253–291. arXiv:hep-th/9802150 . Bibcode:1998hep.th....2150W. ↑ Seiberg, Nathan; Witten, Edward (1999). "String Theory and Noncommutative Geometry". Journal of High Energy Physics (9): 032. arXiv:hep-th/9908142 . Bibcode:1999JHEP...09..032S. doi:10.1088/1126-6708/1999/09/032. ↑ Seiberg, Nathan; Witten, Edward (1994). "Electric-magnetic duality, monopole condensation, and confinement in N=2 supersymmetric Yang-Mills theory". Nuclear Physics B. 426 (1): 19–52. arXiv:hep-th/9407087 . Bibcode:1994NuPhB.426...19S. doi:10.1016/0550-3213(94)90124-4. ↑ "Edward Witten", The President's National Medal of Science: Recipient Details. ↑ "Il premio Pitagora al fisico teorico Witten". Il Crotonese (in Italian). September 23, 2005. ↑ "Foreign Members", The Royal Society. ↑ List of Fellows of the American Mathematical Society, retrieved 2013-09-01. ↑ "Faculty » Ilana B. Witten". princeton.edu. Retrieved 18 November 2016. ↑ "UW Faculty » Daniela M. Witten". washington.edu. Retrieved 9 July 2015. ↑ "Advisory Council". J Street. 2016. Retrieved 2016-10-14. Wikimedia Commons has media related to Edward Witten. O'Connor, John J.; Robertson, Edmund F., "Edward Witten", MacTutor History of Mathematics archive, University of St Andrews .